This is the longest two weeks of my entire life!" my daughter, Elisabeth, groaned last December while flopping onto the sofa. At age 4, she was experiencing her first winter break from school -- and she wasn't happy about it. She missed her teacher, her friends, her school routine. But the more she sighed, the more I celebrated. What better evidence that her first school experience was going well? And now it's September. How can I ensure that Elisabeth's love of school stays with her as she adjusts to kindergarten, with a new classroom, teacher, and expectations? The key, say educators and parents who've been there, will be for me to stay involved in her school life, but not to focus on academics -- yet. "There's a wide range of readiness among young children for reading, writing, and adding. These skills will come in time. Meanwhile, your job is to help your kids view school as a happy place to be," says Carissa Olivi, a former preschool teacher who's now on the board of education in Orange, NJ. For some children, a positive attitude about school may require coaxing, since school presents a lot of new challenges -- being away from Mom, making new friends, taking turns. Here's how to help your child meet those challenges -- whether he's starting kindergarten, preschool, or a two-mornings-a-week nursery program. It's not always easy to get anywhere on time with little kids, but it's worth making an extra effort to be prompt on school days. "A child may feel like an outsider if the others are already there, engaged in activities," says Marilyn Gootman, author of The Loving Parent's Guide to Discipline. Diane Max, a mother of three in New York City, finds it can be hard for her son, Jonah, now in kindergarten, to cross the threshold if the classroom is already bustling. "It's much easier for him if we get there a bit early," she says -- especially on "high-risk" shyness days, such as the beginning of the school year and the first days back after vacation or illness. Being on time at the end of the day is just as important. Standing alone while the other kids are happily reuniting with loved ones can cause a young child to worry that by going to school, she risks losing you -- or getting lost. A main part of the "curriculum" for children starting school is learning to feel secure in the classroom even though they're away from Mom, Dad, or babysitter. You can help by trying to keep your own anxiety in check, as a child's fear is often fueled by his parents'. If you seem worried, he may decide school isn't a safe or nice place to be. If school doesn't go smoothly for a child, it's human nature to blame the teacher. But accusations are sure to backfire, even if the teacher really is part of the problem. If you accuse him, you put him on the defensive, which is counterproductive. "Instead, say in a nonthreatening way that you're concerned for your child, and ask how you can work together to solve the problem," says Gootman. "Teachers feel positive when they see that a parent cares and is interested and concerned but not breathing down their necks or telling them how to teach." They also find it helpful if parents alert them to any information they have about how children are feeling at school. For instance, some kids may be stoic if someone hits or teases them, but cry about it when they get home. It helps to keep the teacher in the loop. To the degree that your schedule permits, help out in the classroom, participate in fund-raising, join the PTA, read the school newsletter. Your involvement lets your child know that his school is a part of your world, too. More than that, volunteering helps you watch out for your child's interests. To build strong connections between home and school, you need to have a sense of what's going on in your child's classroom. Natalie Cull, a mother of three in Wildwood, MS, always sits her two oldest daughters, ages 10 and 7, down at the kitchen table in the afternoon and gives them 15 minutes of her undivided attention. Whether your child's class studies butterflies, your hometown, baby animals, or holiday traditions, the topic is a way to train kids to think, remember, make connections, and theorize, all of which are foundations for future learning. You can help by stoking your child's curiosity and enthusiasm about whatever subject is being covered at school. For example, Schwartz is planning a trip to the local science museum now that her 6-year-old son, Jeff, is studying rain forests in kindergarten. The night after an animal handler came to his class, he excitedly recounted to her how the lizard used its tail to defend itself. "His world had suddenly expanded. He was fascinated," says Schwartz. Children don't really need a slew of extracurricular activities; even a half day of school can be stimulation enough. Exhausted, stressed-out kids have a harder time adjusting to school. So don't sign up your child for anything unless she's wildly enthusiastic and begging to go. And if she changes her mind, let her quit. Schwartz says she made a mistake when she paid for an entire year's worth of dance lessons for her son when he was 5. "He really wanted to do it, but when it was time to go to class, he'd be playing with his brothers and I'd practically have to rip him away," she explains. "If I had to do it over again, I wouldn't pay for the whole year in advance." Today, our VolunteerSpotlight shines on Susan Marquardt, who used VolunteerSpot's online signup sheets to coordinate food donations for a school wide event. " It was so easy and looked so professional. I really appreciated the ability to coordinate responses from each of my volunteers without flooding my inbox (and theirs) with a zillion "reply all" responses. The reminder e-mail was great and was a step I might not have even got to on my own. I also liked the ability to print a report as to who was bringing what. I love this tool/website and will definitely use it again!" Read on to learn more about Susan and her experience! I recently tried Volunteerspot for the first time when working on a school-wide breakfast event which I co-chaired. I have volunteered in my childrens' schools, through a gymnastics booster club, and through a competitive dance fundraising group. There are so many ways to get involved and not all volunteer opportunities are advertised. If there is something you are good at or a way in which you think you can help, offer yourself up! It is not uncommon to find that people often want help, but are afraid to ask for it. Volunteering always makes me feel good and I have met so many great people I would not have met otherwise, were I not to get involved as a volunteer. I am not a fan of "reply all" solicitations for donations and/or volunteers for special events. I don't want to know what the 47 other volunteers that are participating can or can't do and I definitely am not interested in the slew of e-mails that accompany those types of requests. VolunteerSpot is sooo simple for both the coordinator AND the volunteers. It is very user-friendly and truly took a minimal amount of time to set-up. I am just kicking myself for not trying it sooner! Volunteering gives you back 10 fold what you put into it! Find what interests you, what your are passionate about, and get involved. We salute Susan and all the other volunteer leaders out there making a difference in our communities. If you're using VolunteerSpot, write and tell us about what you're doing and give us a chance to shine our Volunteer Spotlight on you!! Just email us at VS@volunteerspot.com. “Tell me a fact and I’ll learn. Tell me a truth and I’ll believe. As the mom of two budding readers — my daughters are 5 —my life is full of stories, it seems. Storytelling also plays a key role in my professional and volunteer worlds; as a marketer, I’ve helped organizations create and communicate their stories for over a decade. Stories are also the inspiration behind Books Make it Better, a grassroots early literacy movement I co-founded after learning from Reach Out and Read that 2/3 of America’s children who live in poverty don’t have any books at home. But although we’re exposed to the notion of “story” since before we can read— or even speak — most of us forget the simple power that storytelling can play when it comes to rallying and engaging others to support the causes we champion. Here are 3 tips to get you started…. When we’re passionate about a cause, it’s easy to get fired up — and caught up — in facts and figures when sharing our message. Unfortunately, most people don’t absorb information this way: a London School of Business study found that 5-10% of people retain information when you share it in a statistic format. If you add a story, 25-30% will retain it. But if you simply tell a story, the number increases to 65-70%. The UN Foundation’s Shot@Life Campaign does a great job of engaging supporters through storytelling. Their blog shares many stories from the perspectives of moms around the world whose children aren’t surviving childhood due to lack of vaccine access. As a mom, I can relate to these stories far more than I can to stats — such as Felisa Hilbert’s post, “Safe for a Lifetime” which brings humanity, and a human face, to the growing global health crisis, and connects us all to the idea that we can play a role at giving kids in developing countries a shot at so much more than they are currently experiencing. Great stories are revealed over time, chapter by chapter. Many of us forget this when trying to introduce potential volunteers and supporters, and we try to get our entire message across all at once. This can be overwhelming, and confusing…and a lot of work! People engage based on a series of touchpoints and impressions —or chapters—that unfold over time. The Mom Congress on Education & Learning blog is a great example; each week; they share stories from across the country on how to engage in the fight for better schools. As Oregon’s 2011 Delegate, I was honored to share my “chapter,” on “What’s Working in Oregon,” earlier this year, and I am inspired each week by the diversity that moms from across the country are bringing to local education reform when I read new updates. I share some other related tips in “Learn from me Please: 5 Tips for Social Change from the Branding Trenches, too. 3. Never Underestimate The Power of A Picture. Don’t forget the role that creative visuals can play in engaging your supporters! Research shows that people pay attention to — and believe — information more when accompanied with visuals. Some good examples include Mashable’s Social Good Ecosystem, Jumpstart’s Infographic of The Early Education Crisis, and Reusethisbag.com’s on the Importance of Recycling. I also love The Motherhood’s Charter, because it tells far more powerful a story about what this community stands for, and delivers, than a few paragraphs ever could. Summing It Up…And Onto My Own Next Chapter! Isn’t that what we’re ultimately looking for when we engage current and potential volunteers to align around our mission? And speaking of taking a leap…I’m thrilled to share that the next chapter in my own “story” is unfolding, too. I recently returned to my non-profit roots in a full-time role as Executive Director of Schoolhouse Supplies, in Portland, Oregon. I’ll be sharing more perspectives from our volunteer-run Free Store for Teachers, in an upcoming post. Stay tuned and until then…keep up your fantastic summers of service! Jen Barth is Executive Director of Schoolhouse Supplies, an award-winning nonprofit in Portland, Oregon that serves classrooms in need by operating a volunteer-run Free Store for Teachers stocked with supplies donated by the community. Prior to her role at Schoolhouse Supplies, Jen founded and ran Big Small Brands, an award-winning small business and nonprofit branding firm, and held senior leadership roles in several agency, corporate, and non-profit organizations. She also served as Oregon's 2011 delegate for The Mom Congress on Education and Learning, and founded Books Make it Better, a grassroots, mom-powered early literacy movement in partnership with Parenting Magazine. Jen is a Founding Member of The Mission List, a community of women dedicated to using social media for social good. Jen is the proud mom of identical —yet nothing alike — twin daughters, who will be entering Kindergarten this Fall. They have been accompanying their mom on volunteer projects since the ripe old age of 2 ½. The 2012 Summer Olympics kick off this week, bringing the world together with the universal notion that hard work and determination knows no bounds. Is the same not true for volunteering? Are volunteers not people uniting in commitment and dedication to a common goal – to serve others? Recognize your medal winning, record-setting volunteers with these five fun, Olympic-sized appreciation tips! 1. Honor Your "Coaches": Volunteer management is a full-time job that oftentimes falls beneath the radar. Take the time to honor those leaders behind the scenes who are managing schedules, organizing volunteer calendars, and serving their time and energy to train volunteers with the necessary skills they need to get the job done and make a difference; they are the ones who carry the torch and light they way for future leaders and advocates of your cause! 2. Recognize Your "Medal Winners": While volunteering does not have to be competitive, it is still a worthy endeavor to recognize those exceptional members in service who repeatedly show up, help out, and provide a dependable service to your organization. Put your stellar volunteers on a podium of recognition and let them know how much they are appreciated! 3. Show Your Fans Appreciation: Don't forget to thank the donors and advocates whose faces may not be visible at your events, but whose donations, resources and sponsorship make the good that your organization does possible! 4. Celebrate Your Record Breakers: Keep track and celebrate those milestone events that capture the life of your organization! Utilize digital platforms and local news outlets to honor long-time volunteers and donors who have completed years of service, as well as share remarkable measurements of the impact your volunteers have had in the community, i.e. # of books given to local schools, # of food boxes packed, # of meals served. 5. Every Little Bit Counts: The excitement of the Olympics lies greatly in the inches and hundredths of seconds which separate first from second, and second from third place. Keep the small things in mind when showing your volunteers appreciation. The simplest act of kindness, from a hand-written thank you note, to an email, shout out on facebook, or phone call can make a big impact on a volunteer, letting them know their efforts are truly appreciated and and their help made a difference. As your volunteer group continues to make a difference for the better in your own school, community or even the world, take the time to recognize their efforts, celebrate their achievements and honor them as Olympians in service! As anthropologist Margaret Mead once said, "Never doubt that a small group of committed people can change the world. Indeed, it is the only thing that ever has." Hey Blog Readers, so nice to "meet" you all! If you're like me - you marvel at how fast technology is moving, you revel in all the time you save when you find the perfect app, and sometimes you feel absolutely panicked by the sheer number of digital tools out there. I'm one of those "try any app once" kind of girls…you know, the one who runs around at geek conventions downloading new apps in exchange for a breakfast burritos, (yes this really happened) but at the end of the day here are some of the latest apps that have stuck with me and proven really useful in our digital strategy at work. Bonus - they're all FREE. Let other's know you've quoted them in your story via Twitter (hello retweet potential). Full hashtag integration for Twitter spreads your message like wildfire. Here's one we did of our volunteers in action at Union Station it got 235 twitter clicks! 15 seconds might not seem like a lot but in the world of Social media it's plenty. Use it to shoot your volunteers in action, your quick pitch for recruitment, your advocacy 800 number and more! Back-to-School Night is the big night to kick off the school year! It’s a vital time for cultivating school spirit, recruiting volunteers and building excitement for the school year and fundraisers ahead! 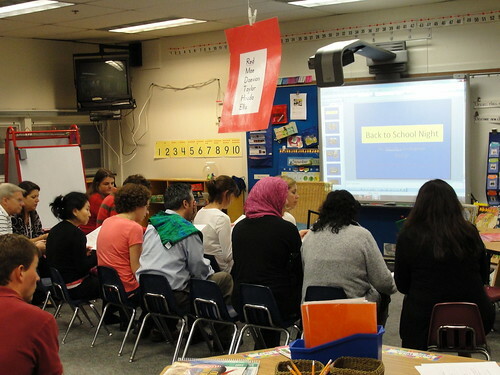 A typical Back-to-School Night brings parents together for a group presentation from the PTA/PTO leaders and Principal before visiting their children’s classrooms to meet the teacher and get a glimpse of the year ahead. Some schools have gone high-tech and parents meet in the classroom for a broadcast welcome from the Principal and Parent Leaders before the teacher speaks. Other schools mix it up with different grades meeting at different days and times, i.e. kindergarten before school begins and older grades within the first two weeks. No matter how your school approaches Back-to-School Night, keep these 10 quick tips in mind for making it a true success! 1. Direct parents where to park (with people and/or clear signs) so no one loses time looking for a spot. Do the same by clearly marking meeting rooms and classrooms – Back to School Night should be welcoming and not leave parents feeling lost. 2. Provide parent leaders with both nametags and pre-printed ribbons that say “Ask Me” so new parents have many opportunities to ask questions. 3. Let parents know all about the fabulous school events and fundraisers to expect this year, but be careful not to focus solely on fundraisers; you want to cultivate strong community spirit before asking for time and resources. 4. Plan out stations (tables or booths) where parents can learn about new school programs, clubs, after-school resources and volunteering opportunities. 5. Prominently post where and how parents can connect online with your school community – i.e. Facebook, Twitter and Pinterest. Consider posting a QR code which parents can snap with their smartphone to connect to your school’s parent group webpage with links to social media. Check out Tips for Getting Your Parent Community Active with Social Media! 6. Encourage parent involvement with a brief explanation of how simple signing up to get involved will be using VolunteerSpot’s online volunteer calendar and scheduler. Show a quick video tour of the sign up process, and provide simple direction to where sign up links will be posted for choosing committees or volunteer commitments. Check out sample Committee Picker Sign Up Sheets! 7. Food and drinks are a MUST for your Back-to-School night – whether you offer cookies and lemonade, or something more involved like pizza or an ice-cream social, food is going to encourage attendance and give parents another way to socialize. 8. Increase attendance to your event by offering free babysitting for parents who need to bring their kids. BTS nights are typically anywhere from 35 to 50 minutes; work with older kids from the local high school to coordinate a play station (small gym) for kids whose parents are attending BTS Night – have food on hand as well, pizza anyone? 9. Set up a system that helps your parent group collect membership dues on site at BTS Night. Not only does this reflect on the organization of your parent group, but it helps parents feel like they have already accomplished something by the end of the night in service to the school. Start the 2012-2013 school year off right with a fun and successful Back To School Night! Coined for this day & age, “stay-cations” connects the joy of taking time off with the reality of staying in town on a budget. If you are planning an individual or family stay-cation, consider a service project as part of the plan and do GOOD while having fun at home! Clean out the closet: De-clutter and pass on gently used clothes, shoes, books and toys to a re-store or local shelter. Community clean up: Tackle the litter in your park, local green space, community garden, trails, or with a non-profit you work with like a church yard, pet shelter or food bank. Get to Work: Connect with local food bank and find out how you can help sorting, packing boxes, and moving food boxes to help feed the community. Garden for Good: Plant rows of food in your garden specifically for donation to a local foodbank. Save Up: Donate a portion of the ‘travel’ money you save by staying in town to a cause your family relates to . Neighborly Love: Surprise a deserving neighbor, whether elderly or a new mom, with a meal, flowers, free yard work, you name it! Cards/Care Packages for the Troops: Connect with an organization that can help get your gifts, cards, and goods to the troops - check out HugsforHeroes and SemperFinest. Support the Arts: Volunteer at a local theatre - see if you can help paint or work on sets, usher, or work the box office or concessions. Get Active: Run a 5K/Walkathon and talk your friends into joining you! Go Digital: Become fans of your favorite local orgs on facebook and Twitter and stay updated with their summer events; then ‘share’ with your social network and help get the word out even further. Sell it: Volunteer for a day at a Habitat Re-store or Salvation Army. Teach it: Offer lessons or tutoring, talk to friends and neighbors or connect with your local library to see if they have a tutoring time you can jump in on. Do What You Love: Volunteer your hobbies with these fun service ideas for every hobby! Block Party: Organize one for your block or neighborhood and help build community where you live! Yard Sale: Is a local organization, school or faith group looking for donations for a rummage sale? Give it to 'em! Do they need help setting up, selling, and cleaning up? Make a day of it! Plant a Tree: You can do this symbolically by purchasing a tree to be planted abroad, or by connecting with a local environmental organization and see if there are tree projects happening where you live. Also visit the Arbor Day Foundation for resources and ideas. Grooming Party: Work with your local animal shelter to provide services for their volunteer needs like grooming, bathing, and travel to adoption events. Kids really love this side of volunteering and it will make for great staycation memories! Found Art Crafts: Either make and donate to a local children’s shelter, or take the supplies and get those kids involved in the fun! Book Drive: Volunteer at your local library, help organize your own family's drive, or set up a fun one-time reading-centered event that other family's can join in on. Get Online: So you have thirty minutes on your hands - why not volunteer online! Check out all the top resources for micro-volunteering! Have Food on Hand: If you’re out and about your city, prepare a few brown bag lunches with water, sandwiches and snacks to hand out to homeless people; or just have granola bars on hand in your car to give out. Get in the Spirit: Host a Summer Olympics (or London Olympics party) in your backyard, encourage your kids to plan and execute it for the neighbor kids, volunteering their time while still having a fun vacay! Christmas in July: Show up to a nursing home and hand out Christmas cards, play Christmas carols on the piano and sing along with them; don't forget small (nut-free) treats for an even sweeter surprise! Ding Dong Ditch: Choose a different family each night for a week and doorbell ditch their house leaving behind a homemade treat with a poem about friendship. Carwash Bomb! Surprise a young family by showing up with buckets and sponges to clean their car (minivan) for them. And of course, afterwards, take everyone out for milkshakes! Say Thanks: Help kids write Thank You notes to leaders and members of the community who volunteer their time or go above and beyond in their leadership role; think Mayor, Sherriff, Policeman/woman, Firefighters, etc. Recycle, Re-use and Give Back: Gather up soda cans and bottles and recycle them. In states where you receive money back, use the money to donate to an agreed upon charity or purchase an item to donate to the local Foster Care Foundation or animal shelter - check out how one Den Leader Turned a Requirement into Compassionate Service! Dinner Special: As a family, go through a popular fast food drive through lane for lunch, then pay for the family behind you without them knowing! Tip Off: Spend a day ‘tipping’ people who don’t expect it, but don’t use cash! Offer your grocery store clerk a pre-written thank you note, surprise the bank teller with a gourmet lollipop and a wink, say hello to three people in the park and offer a compliment and a smile just because; best of all, serve your family up a few extra unexpected tips! Do Good Jar: Create a family Do-Good Jar for your staycation. Fill with thoughtful ideas: make your sister’s bed, do the dishes before being asked, surprise mom with a cold drink, whisper to dad you love him THIS much! From the simple to the sublime… add a little service to your stay-at-home vacation this summer! The effort and energy behind getting GOOD done most often comes from those willing to serve of their own time and resources, volunteers. Whether it's for your nonprofit, school, community organization, or faith group, finding volunteers isn't always as simple as picking up the phone and asking. Check out our top resources, tips and strategies for recruiting volunteers to make doing good even easier! > From free online sign up sheets, to incentives, community networking and more - our Top 10 Ways to Recruit Volunteers is a must-read! > Capture potential volunteers as soon as they visit your site with fun and engaging content, and calls to action - see 10 Ways to Pump Up Your Volunteer Web Page! > Are you trying the "online thing" but meeting some resistance from your volunteers? Encourage your tech-timid crowd with our Tips For Getting Volunteers Active in Your Online Communities! > Chances are some (most!) of your volunteers are on facebook, twitter and other social media outlets - don't miss our practical guide to Recruiting (Retaining and Recognizing) Volunteers with Social Media! Volunteer recruitment isn't simply about finding warm bodies to get work done - it's about forming giving communities who are loyal to your organization, advocate for your cause, and are invested in doing GOOD in your community! With practical ideas, online engagement, and an array of recruitment strategies, one of your biggest volunteer management hurtles can quickly become a shining acheivement! Friday the 13th occurs this week and whether it's being stir-crazy in the summer heat or simply superstition, , we all know that means kids can go a little 'wonky'! We're thrilled to share this guest post from Parenting.com with tips and tricks about correcting ill behavior in children - straight from the men and women who deal with it daily (from 20 or 30 kids), teachers! As I sat on a teeny-tiny chair reading to Vivian in her kindergarten classroom, I noticed her teacher, Debbie, do something that made my jaw drop. "David called me 'liar liar pants on fire!' and he didn't stop!" one boy reported to Debbie. Debbie took David's hand and said, "Come over here and help me make sure I have enough milk for snack." That's why Debbie is Debbie and I'm a mess. In one simple move, she removed him from the conflict, distracted him from the joy of teasing, gave him attention he obviously needed (but not the kind of negative attention he may be used to), and made him feel like a useful part of the class, rather than a fringe kid who only gets noticed when he razzes others. That would never have occurred to me. Debbie is clearly not the only teacher who has a few brilliant tricks up her sleeve -- techniques that she's learned over the years to keep her whole class engaged, paying attention, and (for the most part) behaving for seven hours, five days a week. I knew I had a thing or 20 to learn. Following: teacher tricks you can steal to keep your guys on the straight and narrow. "If I see two kids pushing in line, I might say, 'Pao and Tommy, please make a different choice,'" says Michelle Mertes, a first-grade teacher in Wausau, WI. "Kids typically know what they're doing wrong, and using this technique gives them the chance to change their choices and make me proud." Which, she says, kids really want to do, despite their occasional in-your-face behavior. "Seeing a disappointed adult is more powerful than being yelled at," she says. If they don't come up with a better choice, of course, then it's time to take away a privilege, like the chance to sit next to a friend. "If a kid is doing something ridiculous, look at her like you're disgusted or make her feel a little guilty," says Alison Frank, a kindergarten/first-grade teacher in Encinitas, CA. Let's say your child is fondling every piece of fruit in the grocery. "It's probably better to say 'I hope you don't have a cold coming on -- now someone is going to buy that and your germs will be all over it,' rather than 'Don't touch that.'" This gives her both a good reason to stop and a chance to think about how her action affects others. Like a security guard tailing a shoplifter may deter the crime, sometimes just standing near a kidwho is breaking the rules will curtail the behavior -- you may not even need to stop what you're doing or say anything. Elaine Smith, a third-grade teacher in West Bloomfield, MI, says that while she's teaching, she'll simply drift over to where the kid is goofing around, and perhaps come up behind him and place her hands on his desk. The mom equivalent might be to make your presence known by peeking into your child's room or lurking in the hallway or peering over his shoulder while you're on the phone (and he's doodling instead of doing homework). If he knows you're onto him, he may stop. Not to beg, but to look the child square in the eye. "Women tend to stand up when talking to kids, whereas men tend to kneel down and get eye-to-eye," points out Nick Ferreira, a former teacher who is now an education adviser at Child Center New York, a nonprofit child and family support organization in New York City. "Getting down to their level changes it from a huge scary interaction to a direct conversation," he says. When a child repeatedly acts out in a particular way, find the positive in it and help her use this "power" for good, not for evil. Christine Herring, a third-grade teacher from Monroeville, PA, recalls one girl who was ¿ber-bossy, which caused her classmates to reject her -- and led her to misbehave. "I told her, 'You know, you have a strong personality, and someday you could be President. But the problem is, to be President, people have to like you. Your friends don't like it when you're bossy. So think of yourself as a President-in-training, and start really working on respecting your classmates, listening to them, and knowing when to use your bossiness.'" Once Herring had helped the girl understand the best times to use her strong leadership ability, like when organizing a game, things went more smoothly. If your child can't sit still, his superpower might be "energy," which you can direct him to use at the right time and place (for the fastest cleanup on record, maybe, or when he's out in the yard). If she's a cutup and disturbs other diners in the restaurant with her Hannah Montana medleys, praise her ability to make people laugh, but give her an outlet where her superpower will be appreciated -- a musical-theater class, for instance, or an evening performance for you and your husband. If she breaks into song at the wrong time, you can say, "You're not using your superpower correctly," says Herring. "They start to get it after a while." Find the rest of these 13 creative (and helpful!) tips, tricks and techniques over on Parenting.com! The USDA reports that nearly one in four children in the United States are living in a food insecure household or a household where members are unable “to consistently access the adequate amount of nutritious food necessary for a healthy life." Households with children experience food insecurity at significantly higher rates than the population in general: 21.3% of households with children are characterized as food insecure versus 14.7% of all households. Snack Pak 4 Kids (SP4K) is a weekend backpack program that serves over 2800 students in nine Texas Panhandle school districts. Volunteers pack 10-12 nutritious snacks in plastic bags, deliver them to the school, and place them in backpacks to be discreetly sent home each Friday. Today, our spotlight shines on Dyron Howell, who uses VolunterSpot's online signup sheets to organize volunteers for the Snack Pak 4 Kids program in Amarillo, TX. Every other week over 170 volunteers pack 10-12 nutritious snacks in plastic bags, deliver them to the school, and place them in backpacks to be discreetly sent home each Friday. How did you get involved with Snack Pak 4 Kids? In 2010, I discovered that Amarillo was the largest city west of Dallas without a weekend backpack program. My wife and I started a program out of our home, serving ten children at Will Rogers Elementary on Labor Day weekend, 2010. We now serve about 2800 kids each weekend in nine school districts on 50 campuses around our community. How do you identify the chidren who are in need? The targeted students are those who live in food-insecure homes as identified by the school staff (counselor, nurse, principal, and teachers). SP4K provides a bag for each elementary student (as well as any siblings at home not old enough to attend school). Our website designer heard about it and suggested we give it a try. We used it on a small scale at first to make sure it fit our needs. In the fall we will be expanding it to all of our volunteers. Why did you decide to use it for this program? We managed 3000 volunteers this year, and our needs are complex, so we we need to make it easy for our organizers and volunteers. VolunteerSpot helped in both cases. We are also partnering with the Junior League, who will organize their volunteers to help with our program. Since we use 100% of the money we raise to purchase food for the program, we need to utilize whatever resources we can. 25% of our volunteers are over 60 so they will call in and then we can put them in the system ourselves. 40% of our volunteers are kids, who can easily sign up themselves online based on their availability, and so can the families. We learned through our pilot which groups can signup online. It's a huge resource, and frees us from having to hire another person to do that job. What has been the reaction to Snack Pak 4 Kids? "It make me feel relieved because I know I don't have to worry about lack of food." "I love it because we don't have enough food." " It makes me feel happy and like someone cares like my parents care for me." "I feel happy because I will have food to eat over the weekend because my mom doesn't have enough money to buy food." "Happy because we don't need to starve again. "It makes me feel happy because we don't have to die of hungryness." Recently we did an essay and art project at some of elementary schools and asked the question "What does hunger feel like?" Visit HERE to read some of their stories. These stories are why I volunteer in schools and started this program. No child should be able to write these stories in a country where we are so blessed. How can others start a program like this in their community? Contact us through the website, and we'll show you how to get started. Do you have any advice for other community leaders out there? There are different financial levels within each community, so kids in every school need help, not only in certain schools. Many non-profits foget the reason why they are in existance in the first place. We rally around that. When people ask how they can help, I ask "What are you good at? What is your gift?" That's where I plug them in to the program...doing something they're already good, vs one size fits all. For example...in our community, there are four businesses owned by one group. They know about our program, and wanted to help. Recently, they hosted a golf tournament to benefit our organization, and took care of everything. I hope when others learn about the program, they will start programs in their own community, using our program as a template. There are some fundamental elements that need to be done to make this happen, like developing partnerships with schools, and finding a group of donors who believe in this. We hope to be a one stop shop for others to help them get started. To learn more about Snack Pak 4 Kids, visit their website or facebook page, or read this Article about the program. We salute Dyron, Snack Pak 4 Kids, and all the other volunteer leaders and community groups out there making a difference. If you're using VolunteerSpot, write and tell us about what you're doing and give us a chance to shine our Volunteer Spotlight on you!! Just email us at VS@volunteerspot.com. We hope everyone enjoys a day off filled with barbeques, fireworks, family and friends! We are so thankful for those men and women who serve everyday to preserve our freedoms, and to the Founding Fathers for whom this holiday is possible! 10 Ways to Beat the Heat & Do Good! 1. Find out how you can help those affected by the wildfires in Colorado with a list of agencies from the HuffingtonPost and thoughtful ideas via HandsOnNetwork. 2. For your next pool party or bbq, include a simple request with your invitations that attendance requires a non-perishable food donation. Decorate a box placed at the front door for drop off as your guests (adults and kids) arrive, and make a point to get those goods to a local shelter or food bank in need. 3. Pump up your family reunion with a day of service, creating meaningful memories by doing good together! Connect with local organizations or plan your own community clean-up; end with a visit to the waterpark or local natural water attraction. 4. Recognize your volunteers this summer with a thoughtful thank you note and gift card to a nearby ice cream or frozen yogurt shop. 5. Donate water bottles and fans; contact local shelters and food banks to find out what cooling items they are most in need of; make a point to collect and deliver them to bring relief to folks in your community. 6. Surprise an elderly neighbor or young family on your street with a sweet cool treat! It is exceptionally important for young children and the elderly to stay cool during a heat wave. Popping by for a visit not only shows you care, but a sweet cool treat like homemade popsicles or ice cream sundaes brings smiles all around. 7. Volunteer at a 5K/Walk-a-thon - sure you’re probably not up for running in the heat, but you can slap on some sunscreen and be there for those who are. Volunteer to man water tables, registration, parking, etc. 8. If you have the proper certification, teach swim lessons! Find a good reason to take a dip while giving back and teach swim lessons for free to friends’ kids or a group you connect with through local community organizations. 9. The show must go on despite the heat when it comes to summer camp! Volunteer your time as a lifeguard, a kitchen aid (“bug juice anyone”? ), or a nurse who is on hand to make sure everyone is enjoying the sun safely! 10. Clean out your closet and donate those gently used shorts, t-shirts, tank tops, you name it – help provide a summer wardrobe for someone who cannot afford it this year.